Seasonal changes could impact the timing of menopause, besides to other factors such as a woman's dwindling supply of eggs, Hungarian fertility experts said on a recent investigation. Dr. János Garai, lead researcher from Baranya County Teaching Hospital in Pécs, Hungary, recently published a study which showed the results from an investigation which suggests there is a definitive link to the onset of menopausal symptoms and the seasons. They consider that menopause is a complex set of symptoms that is determined partly by external and partly by internal influences. Also, there are only scarce data about the exact nature of environmental and/or lifestyle determinants. 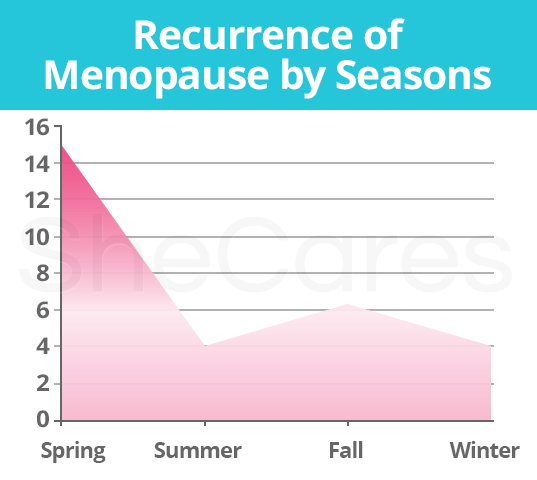 That is the reason why their investigation had as a primary source a survey that questioned 102 women on recalling the exact month of menopausal beginning (discontinuation of their periods). Seventy two women remembered the exact month that their menopausal periods stopped, while thirty could recall only the season. Besides this time of the last menstrual cycle, the study also considered various diet and exercise questions, but the seasons appeared to be the most influential cause leading to menopause. Dr. Garai and his fellow Hungarian fertility experts published their study in the journal “Human Reproduction”, which is the leading reproductive medicine publication in Europe. The results of their investigation revealed that spring and autumn equinoxes are evidently related to the timing of menopause. "We found that there was a high peak after the spring equinox and another, lower one, after the autumn equinox," said Dr. Janos Garai. The recurrence of menopause start can be seen on the chart on the right. On the other side, the Hungarian investigators are looking for the triggering factors and the mediators involved, although they would require further researches. But, there is a presumption that melatonin, a hormone which plays a role in the circadian rhythm (the 24 hour time clock that governs different physiological processes), could be involved. Melatonin binding is found in the ovaries and it also influences ovarian steroid hormone production. A complementary research has shown that the harmony of these links becomes disrupted in parallel with a fall in melatonin levels when menopause starts. Note: This story has been adapted from a news release issued by European Society For Human Reproduction And Embryology.